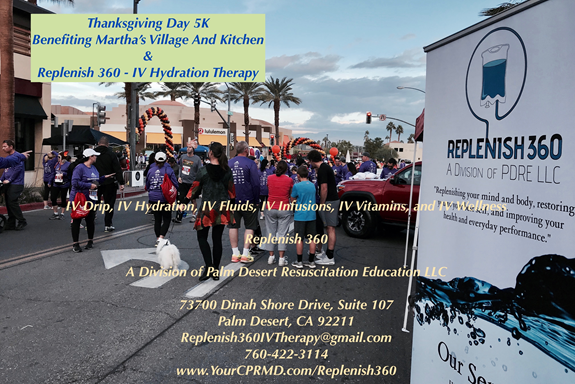 Obviously, the signs and symptoms of mild and moderate dehydration that Replenish 360 (R360) wants to address may start out as subjective “thirst” with dry mucosal membranes and impaired thermoregulation (i.e., for lay folks, being able to cool oneself appropriately and correctly due to the heat production caused by metabolic processes inside your body) as well as indistinct discomfort and even loss of your desire for food intake but, at 4% water deficit or fluid loss by body weight, an individual’s work capacity starts to decline by as much as 30% of their normal work capacity, which negatively impacts their peak performance and productivity in their daily activities of living. Please be rest assured that you are in good hands with us and by choosing Replenish 360 (R360), you will have full VIP access to one of the best, most professional and hygienic Intravenous (IV) Hydration Therapy and Wellness Clinic services including other point-of-care restorative and wellness amenities by our experienced healthcare professionals and other skilled wellness referral services through first-rate nutritionists/dietitians, fitness trainers, massage therapists, acupuncturists, behavioral therapists, and health enthusiasts. Mostly, our top-of-the-line and personalized hydration and wellness facilities are for the healthy individuals who are marginally parched and desire to replenish not only their body and mind from mild to moderate dehydration with life-sustaining fluids, vitamins, anti-oxidants, and antioxidants but also may want to achieve alternative and homeopathic remedies for their minor nausea and vomiting, muscle pain/discomfort, fatigue, weight control, and stress relief just to name a few of the indications for our services. What are the side effects and adverse reactions if one drinks too much water? Water does not have the same consistency and levels of solute as the blood’s pH; it is mostly hypotonic and may cause a dilution of the vital salts in the body and producing a decrease in intrinsic sodium, preventing proper physiological functioning; it may lead to the swelling of the brain, compression of the brain in a closed compartment of the skull, and the sequelae of neurological symptoms and signs of nausea, vomiting, weakness, seizures, coma, and death. Other neurological disease that may occur include central pontine myelinolysis (also called osmotic demyelination syndrome or central pontine myelinosis) that is a severe damage of the myelin sheath of nerve cells in the brainstem which arises from sodium treatment induced. The latter is a complication of treatment of patients with profound, life-threatening electrolyte abnormalities, which may be the result of chronic or untreated polydipsia (excessive thirst or excess drinking). What about the cliché of “try to drink 8 eight-ounce glasses of water every day” that most people tend to say in order to reach one’s daily oral fluid intake? Let’s get down to some conversions with the International System of Units (SI) and United States (US) system of measurements: each US fluid ounce equals to approximately 0.0295735 liters of capacity and volume in the metric system and, thus, an 8 eight-ounce glasses of water is roughly about 1.9 liters. Is this truly the correct and appropriate oral intake of water an individual needs every day?